Provide comfort for the family of Billy Willis with a meaningful gesture of sympathy. Billy Wayne Willis, beloved husband, father, grandfather, brother, and friend, entered Heaven’s gates on Friday, January 4, 2019, at the age of 90. He was born May 18, 1928, in Tecumseh, Oklahoma to his parents Charles Orville and Helen Willis. He attended school in Tecumseh and Oklahoma City and worked at Tinker AFB until age 17, when he persuaded his father to sign for him to join the US Navy in 1945. Bill spent most of his 2 years of active duty in California. After the war ended, he returned to Oklahoma, and work at Tinker AFB. He and friends were considering going to California to find work but a chance meeting one evening changed his life. He met Harriet Elizabeth Minnich, the love of his life, and they married September 26, 1948. A union that lasted over 67 years, until Harriet’s death in July, 2016.Their union was blessed with two daughters, Marilyn and Susan. Bill was a long time member of the Episcopal Church, he lived his life as a loving husband, devoted father, dedicated civil service employee, and served the Lord and others with all his heart as a dedicated Vestry member and Warden. His ‘military classified’ work at Tinker kept him traveling quite a lot, but he was always involved as much as possible with his children and their interests; dancing classes, lots of family camping trips, band parent member and president. Billy was a talented woodworker, building many pieces of cherished furniture and also a weekend “shade tree mechanic”. 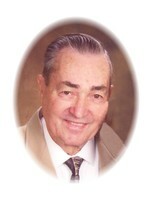 He was a devoted fan of his grandchildren’s sports, dance and music activities. He was known as ‘grandad’ to many softball players over the years. He will be deeply missed by his family and friends, and also his Arbor House family. Bill was a very intelligent, self-made man. He loved to read, especially history of any kind. The last few years, he recounted many funny, and some daring, stories of his travels to acquire classified parts for the B52 military bomber (now unclassified). Some giving Harriet a scare, after the fact. He enjoyed family history, and read over and over the stories collected by both sides of the family. Bill was preceded in death by his loving wife of 67 years, Harriet; his parents; brothers Charles and Donald, cherished little sister, Laurella, and beloved family and friends. Bill leaves wonderful, cherished memories with daughter Marilyn Harrell and husband David; daughter Susan Dunn; granddaughter Amanda Stubbs and husband, Frank; Granddaughter Lisa Keneda; grandson Jonathan Dunn and wife Gabrielle. Five great-grandchildren; Braydon and Ashton Keneda; Madison and Zayne Stubbs; and Ryan Dunn, and many other beloved nieces, nephews, family and friends. To send flowers in memory of Billy Wayne Willis, please visit our Heartfelt Sympathies Store. Please check back for time and date of Memorial Service. Provide comfort for the family of Billy Wayne Willis by sending flowers. To the family of Billy Wayne Willis. My family sends their deepest sympathy to you. Our thoughts and prayers goes out to you. Revelation 21:1-4.